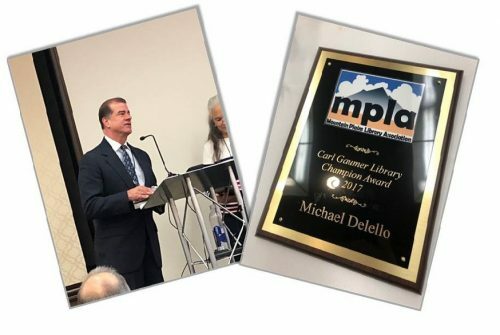 On October 18th at the MPLA annual conference in Lake Tahoe, Nevada, New Mexico Department of Cultural Affairs Deputy Secretary Mike Delello was the recipient of the Mountain Plains Library Association’s (MPLA) Carl Gaumer Library Champion Award for his service as Acting Sate Librarian and continued service to the library community. The Carl Gaumer Library Champion Award is to be given to an individual, organization or company whose positive support of the Mountain Plains Library Association is demonstrated by repeated conscientious endeavors towards libraries, library staff, trustees, and professional activities. Deputy Secretary Delello won the award for his innovative accomplishments and staunch library advocacy while serving as Interim State Librarian during 2014 -2015 and his continued work with libraries state-wide as the Deputy Cabinet Secretary. During his active tenure as interim State Librarian, Delello visited many public and tribal libraries to talk to the library staff and find out what their needs were. He initiated statewide licensing for New Mexico students and job seekers to the online tutoring service Brainfuse, with both HelpNow for homework assistance and JobNow providing help to those seeking employment providing much needed assistance to overly burdened librarians. Delello was also instrumental in the Maker-State initiative, an Institute for Museum and Library Sciences and nationally recognized program through the innovative maker space pop-up program for libraries. Delello also provided a key partnership between the state museums and public libraries statewide by creating the Department of Cultural Affairs Family Pass, which allows library patrons to check out this pass for free admission to the state’s eight museums and Historic Sites. Delello’s support was instrumental in working with a statewide panel of librarians and stakeholders to produce a statewide assessment of New Mexico’s libraries. Delello also served as co-chair of Libraries Transform New Mexico, a conference based upon the assessment. Delello was instrumental in the establishment of the State Library of New Mexico Foundation, and serves as co-chair of the New Mexico Libraries Transform steering committee. “I am so deeply honored to be receiving this award,” Delello said. “Libraries are more than just book repositories. They serve as quasi social service agencies assisting patrons with e-government service, digital literacy, and resume development just to name a few.